I hope everyone enjoyed the Chester County Open Studio Tour last weekend. It’s so fun to see artists and art appreciators alike come together in the more intimate studio setting; for artists to have the opportunity to showcase their process, and for art appreciators to take in the unique headspace and physical work space of their favorite local artists. Studio tours are an kinesthetic way of describing why art is important in the public sphere. I am fortunate to have experienced both sides of the art equation as an art writer/appreciator and artist. So, excuse me while I puff up my chest and say, I can speak from a place of some experience on the intangible nature of the artist spirit. There is nothing quite like the artistic energy that builds up in a studio while trying to stubbornly finish a painting that all but begs to be thrown in the trash. There’s an unmatched satisfaction that comes from taming that unruly painting, sculpture, drawing and turning it into something of value. Those feelings linger in the studio, those emotions linger in the walls and floorboards, and the resulting energy is something that is indescribable. So, thank you artists, for showing us your space and energy. If you missed the Chester County Open Studio Tour, stop by Art Trust gallery in West Chester to catch a smattering of the artists involved in this years event. This show will remain up through June 1. June is a BIG art month, and to prepare, there are a few shows that are coming to an end this month. 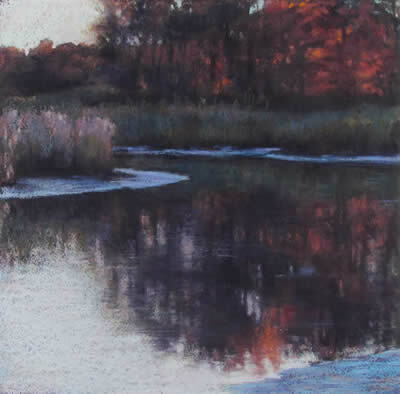 First, Mary Pritchard’s “New Pastels,” at Station Gallery in Greenville will be folding up on May 25. Stop by before the start of Memorial Day Weekend to catch a past glimpse of her bucolic pastels. The gallery will be closed for Memorial Day weekend. Blue Streak Gallery will continue to host Brett Anderson Walker’s solo exhibition, “Being Human,” which showcases a collection of his pastels and oils. You may recognize Walker from his 2016 exhibition at Church Street Gallery. His work is showcased in collections stateside and in Europe. Check this exhibition out before it ends May 30. Chester County Art Alliance is currently hosting it’s last show before their summer programming. 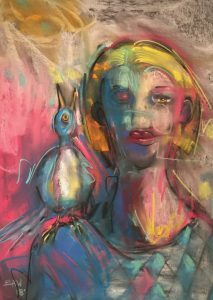 Be sure to check out Ken Gore’s solo exhibition, as well as juried group exhibition Con”text”ual. Both will be up through June 7. Delaware Art Museum unveiled their exhibition “Impermanence: Mystery, Transformation, Light,” which revolves around the basic pillars of Buddhism. This is an all drawing exhibition! Oh how I love all-drawing exhibitions. Painting so often overshadows the dry media genre of art making. People who paint are called painters yet we still lack a formal name for those artists who draw. Illustrators? Draftsmen? Certainly not drawers. What gives? Anyway, go check out this exhibit. If you didn’t get to meet the artists on May 20, you will have another opportunity June 24th from 2 – 4pm. Featured artists include a smattering of Mid Atlantic artists: Sondra Arkin, Lisa Bartolozzi, Stephanie Chang, David D’Orio, Ellen Durkan, Barbara Frank, Charles Guerin, Robyn Phillips-Pendleton, Michael Robear. The show is guest curated by Barbara Warden. As always, tune into Art Watch Radio 1520AM WCHE from 1 – 1:30pm every Wednesday.This Wednesday, May 30th Andrew Stewart, of The Brandywine River Museum of Art, hosts guests from the Center for the Performing Arts, West Chester. Until next time!